This is a special time of year for me. Around this time of year, we first adopted Toki, and now it is our first holiday season with him and our first every Christmas tree. There have been a lot of 'firsts' this year, I feel like. At any rate, we set up our first Christmas tree, my brother came home, I have my wonderful puppy and my family. This, to me, is what this time of year is all about: to celebrate what we have and to make others happy as well. So, as I've said, we set up our first Christmas tree. Toki loves the decorations we have hanging off of it, a little too much in fact. We probably shouldn't put anything within his reach, but we do anyway because the tree looks really odd with nothing on the bottom. At any rate, we just keep an eye on him when he's in the same room as the tree to make sure that he isn't eating anything that he shouldn't. Which, by the way, is really hard since he likes to eat anything and everything he can reach. 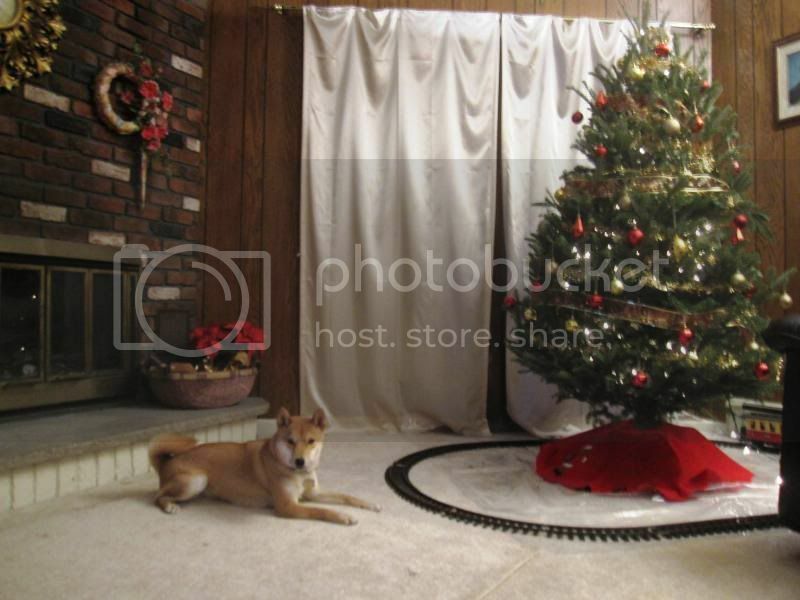 We set up a train underneath the Christmas tree. We've had this train for ages and we set it up every year. Minus the tree, of course. Toki has no idea what this strange thing is, so he is both curious and horrified. Whenever we start it up, he comes running, barking like mad and sniffing at it. He even chased it around the track a few times. It's hilarious and adorable. Lots of things are happening! Everyone's running around. There's this big tree in the house and it's weird. There's lots of shiny stuff hanging from the tree and it looks fun to play with. But when I tried playing with one of them, it broke and Angel's mom got mad at me. There's this thing that moves under the tree. It goes around in a circle. It's weird. I don't know what it is or why it moves. But everyone seems happy and excited. I want to know why they're excited too!